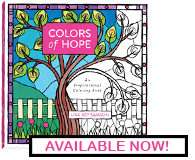 Colors of Hope combines coloring pages based on nature and stained glass windows with hand-picked, encouraging verses from scripture. Each page is perforated for easy removal and a more enjoyable coloring experience. The designs are arranged in mostly groups of four and are suitable for framing or giving as gifts. Colors of Hope unleashes your creativity!